Today's post will conclude the King George VI period with a look at nine commemorative issues that were released between March 3, 1947 and October 26, 1951. 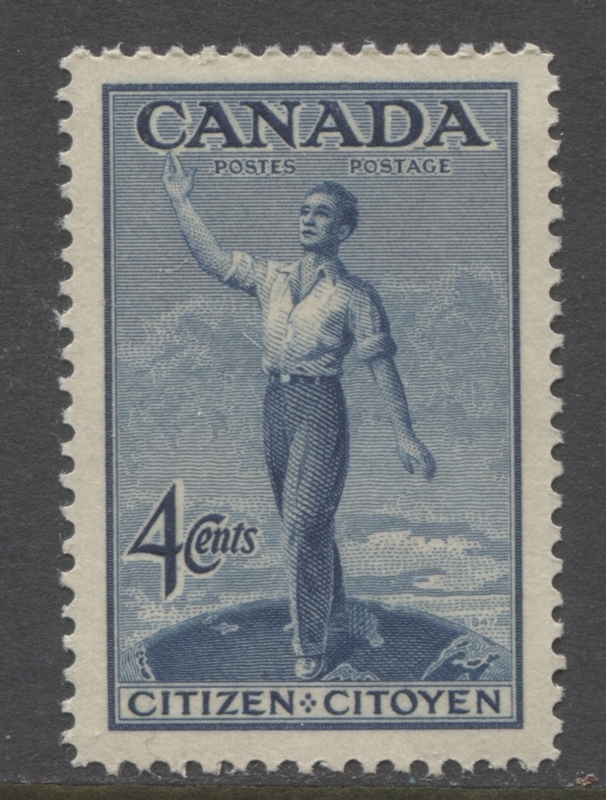 All of the issues, except for the 1947 Canadian Citizenship issue were designed by Herman Herbert Schwartz, who by now, is well known within Canadian philatelic circles as the country's leading stamp designer. He was involved in the production of the model upon which the Citizenship Issue was designed, but the designer himself was Alan Brookman Beddoe. Silas Robert Allen and William F. Ford, both prominent engravers with the Canadian Bank Note Company (CBN), were responsible for all the engraving. The CBN printed all of the issues except for the Prime Ministers series in sheets of 200, which were split into four post office panes of 50, while the Prime Ministers stamps were printed in sheets of 400, which were then split into four post office panes of 100. These commemorative issues are important because they mark the beginning of one very long-established practice in Canadian stamp production. This is the practice of issuing a commemorative series over a four or five year period, with a few different stamps from the series being released each year. 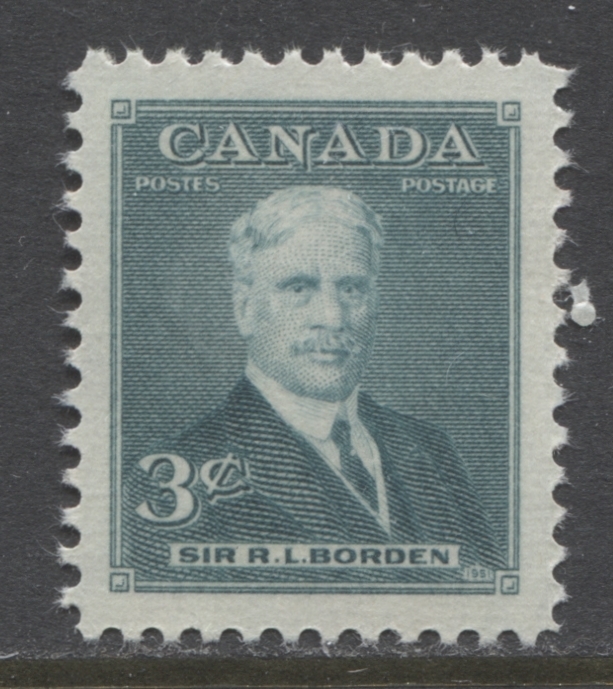 The two Prime Ministers stamps, depicting Robert Borden and William Lyon Mackenzie King, were the first stamps in such a series, which saw the release of two stamps each year, until the last set was released in 1955, for a total of eight stamps. In the years since, there have been many, many commemorative issues that have been issued in this manner. 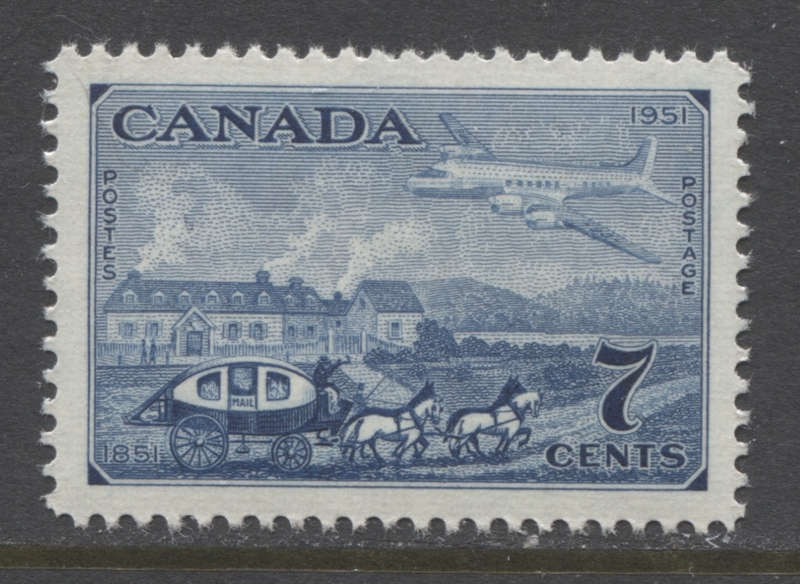 This period also has one very curious and unique aspect: the use of a commemorative stamp as a definitive. 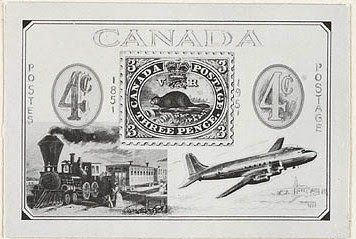 The 1951 Capex issue had as its top value, a 15c stamp depicting the first stamp of Canada, the threepenny beaver. Although it was basically issued as a commemorative, it was retained past the normal period in which it would have been withdrawn and used to replace the 14c Peace Issue. This stamp saw heavy use to pay the foreign airmail rate to Europe, so there was a real need for a 15c definitive stamp, and rather than issue one, the post office sold quantities of this stamp until 1954, when it was replaced by the 15c Gannet stamp. The scope afforded by these issues is more limited than the definitive stamps to be sure, but with patience and attention to detail, it is still possible to find some varieties: shades, a few paper varieties and even some re-entries have been found. It is an ideal range of 13 stamps for those of you wishing to focus on postal history, without too many distractions, as there are plenty of nice on cover usages that you can focus on, as well as a plethora of first day covers, some of which have interesting and scarce cachets. 1. 1947 Birth centenary of Alexander Graham Bell, inventor of the telephone. 2. 1947 80th Anniversary of Confederation and the advent of Canadian citizenship. 3. 1948 Marriage of Princess Elizabeth to Philip Mountbatten. 4. 1948 100th anniversary of responsible government in Canada. 5. 1949 Entry of Newfoundland into Confederation. 6. 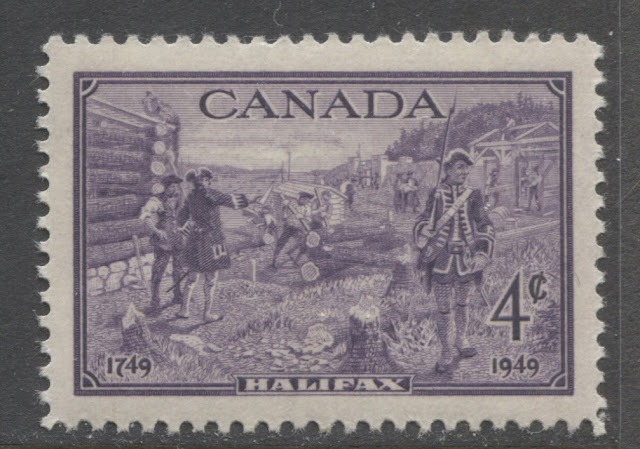 1949 Bicentenary of the founding of Halifax. 7. 1951 Prime Ministers Robert Borden and William Lyon Mackenzie King. 8. 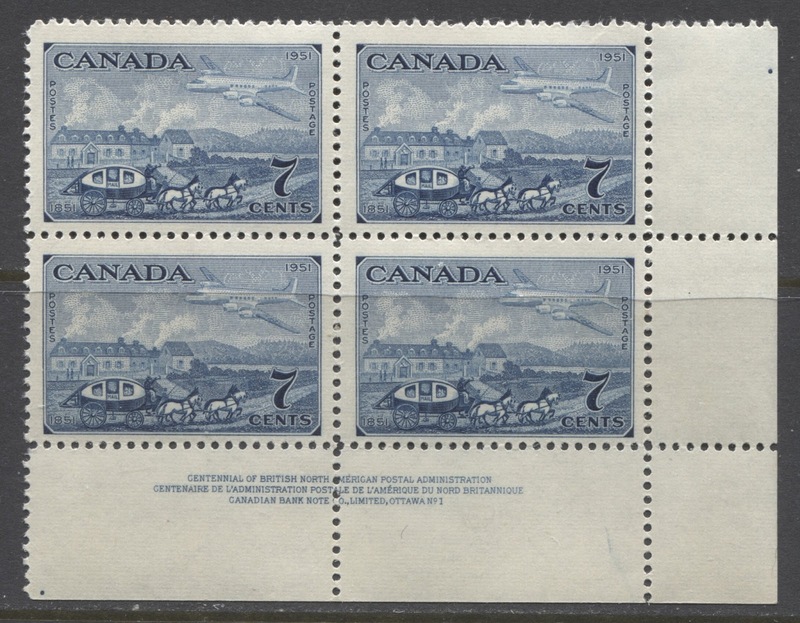 1951 100th anniversary of Canadian postage stamps and CAPEX, Canada's first international philatelic exhibition. 9. 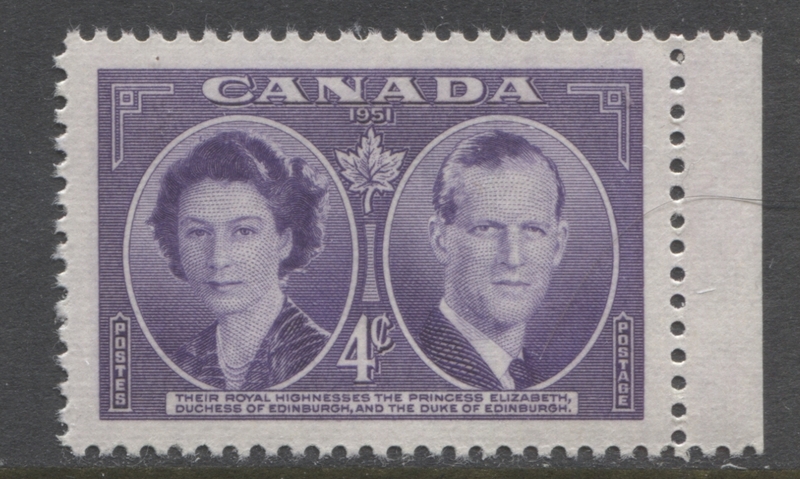 1951 Visit of the Duke and Duchess of Edinburgh to Canada. There are some very beautiful stamps here, which are very, very inexpensive. My favourite ones by far are the Alexander Graham Bell stamp and the Newfoundland entry into Confederation stamps. Both are superb examples of engraver's art. 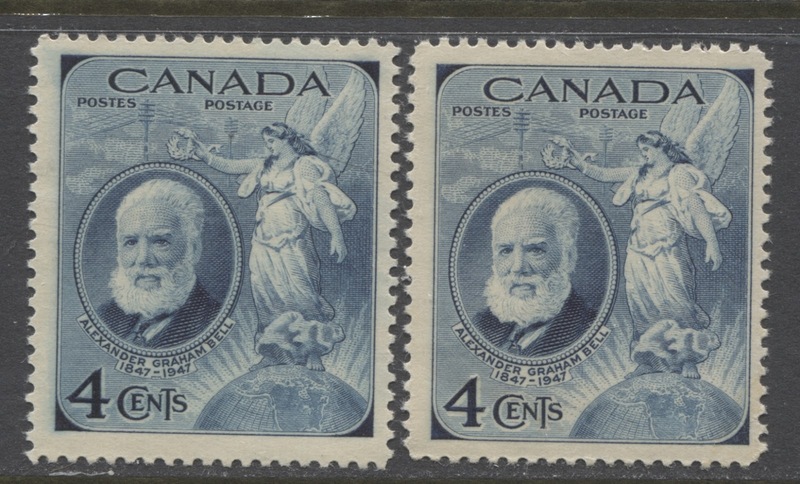 4c dark blue - birth centenary of Alexander Graham Bell. 4c dark blue - 80th anniversary of Confederation and citizenship. 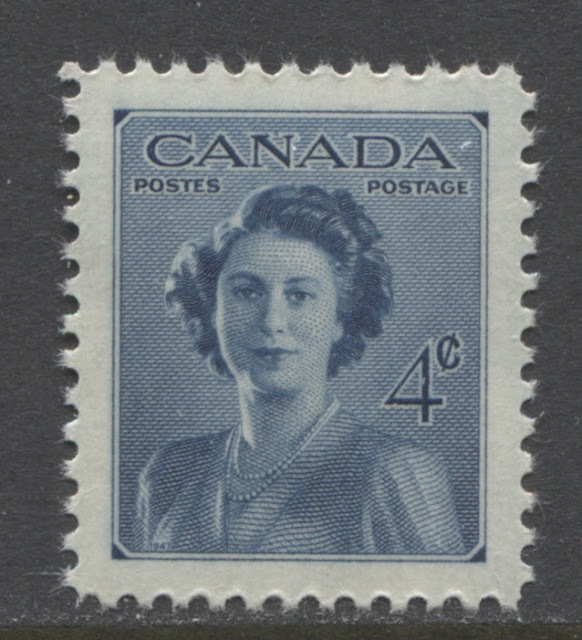 4c dark blue - marriage of Princess Elizabeth. 4c slate grey - centenary of responsible government. 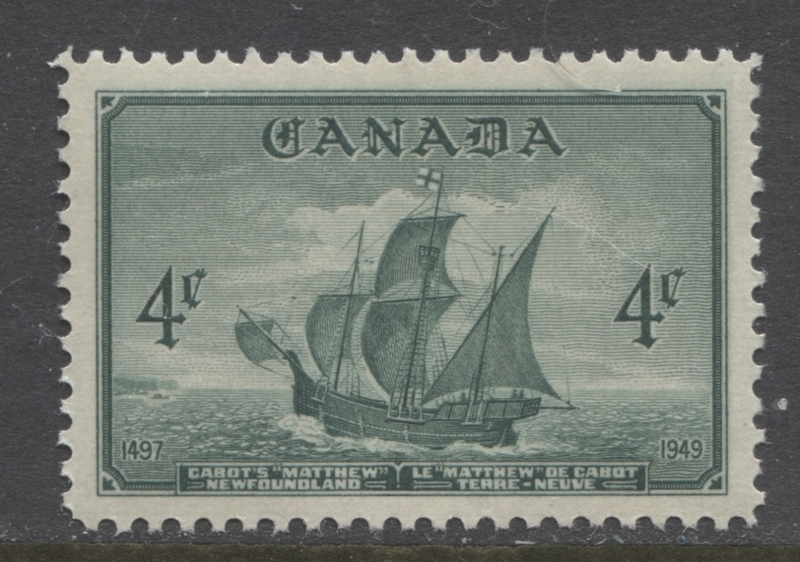 4c dark green - Cabot's ship Matthew. Entry of Newfoundland into Confederation. 4c deep purple - founding of Halifax. 3c turquoise green - Robert Borden. 4c deep carmine rose - William Lyon Mackenzie King. 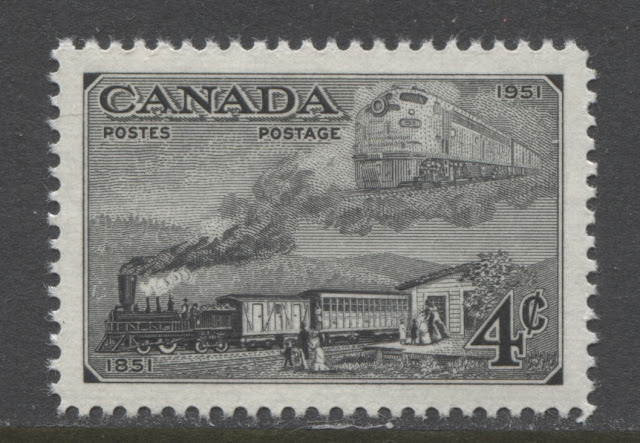 4c black - trains of 1851 and 1951, Capex Issue. 5c deep lilac - steamships of 1851 and 1951, Capex Issue. 7c dark blue - stagecoach and plane - Capex issue. 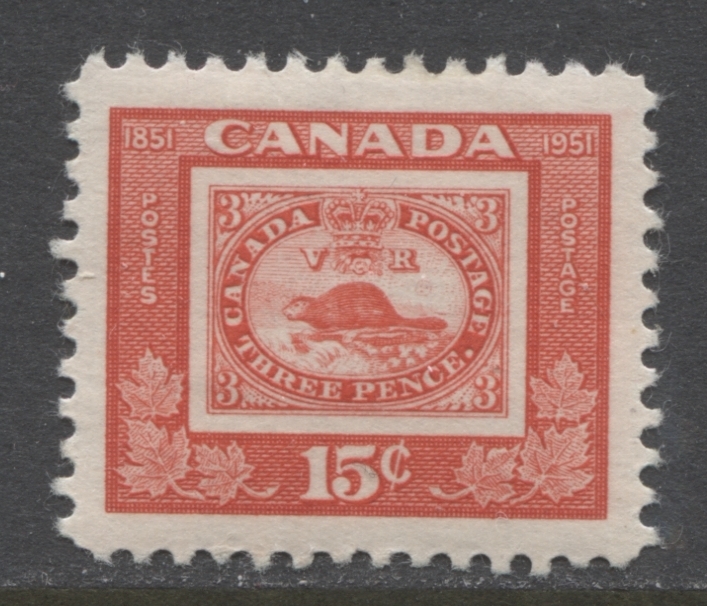 15c vermilion - Threepenny Beaver, Capex Issue. 4c dull violet - Duke and Duchess of Edinburgh. The remainder of this post, will discuss each of the above aspects. Despite a very remarkable uniformity of colour on most of these issues, due largely to their very short periods of use, you will notice after a while some variations in shade. Some of these, like the first two issues that I show below are very subtle and easily overlooked, but some, particularly those involving the purple/lilac/violet inks are quite striking. Indeed it is surprising to me that Unitrade does not at least list the more striking of the shade varieties on these issues. Here we have the 1947 Alexander Graham Bell issue. 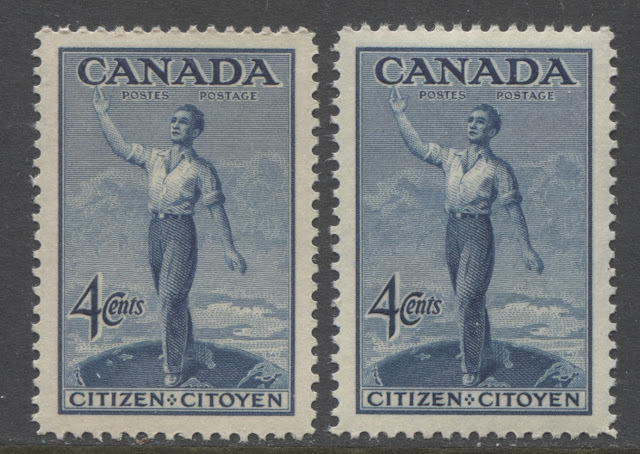 If you look closely, you will see that the blue of the right stamp is slightly deeper, and crisper than the stamp on the left, where the blue is brighter and has a slightly suffused look to it. This is about as subtle as shade varieties get. 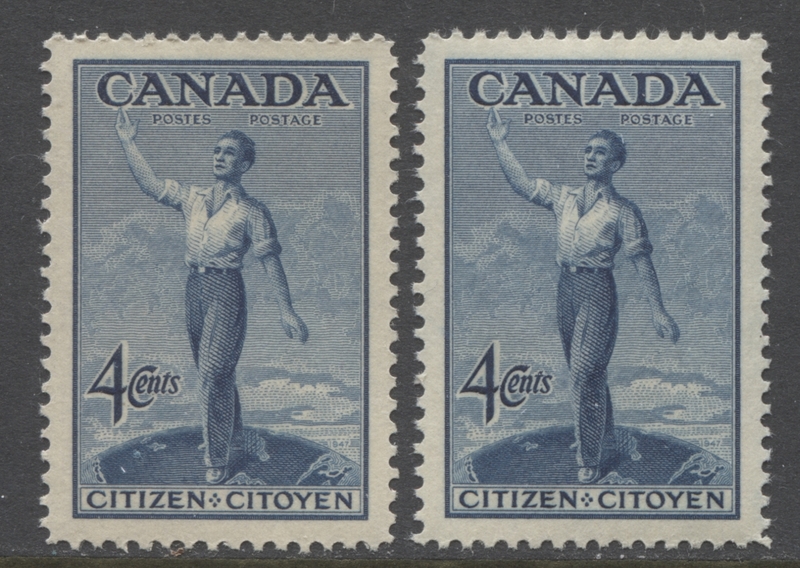 The stamp on the left is a deeper, duller blue than the one on the right, which contains a hint of green. Here we have a very striking variation in the vermilion colour of the 15c Capex issue. The stamp on the left is a much lighter and brighter colour than the stamp on the right. My guess is that since the gum of the left stamp is whiter and the paper is slightly different, that the stamp on the left is actually a later printing made once this stamp's use as a definitive was firmly established. This is the most striking variation I have seen. The stamp on the left is a pale bluish violet, whereas the one on the right is more of a purple violet. It is a deeper, redder colour than the one on the right. The first type is a smooth, cream vertical wove paper that shows only the very lightest surface ribbing when examined with a loupe. Without a loupe, the paper appears smooth and almost has a finished, plate glazed look about it. This is most apparent when you look at the selvage margins on plate blocks of these stamps. The gum that is usually found with this paper type is yellowish cream with a satin sheen. The second type is a soft horizontal wove paper, with no ribbing. The gum is usually a light cream with a satin sheen. 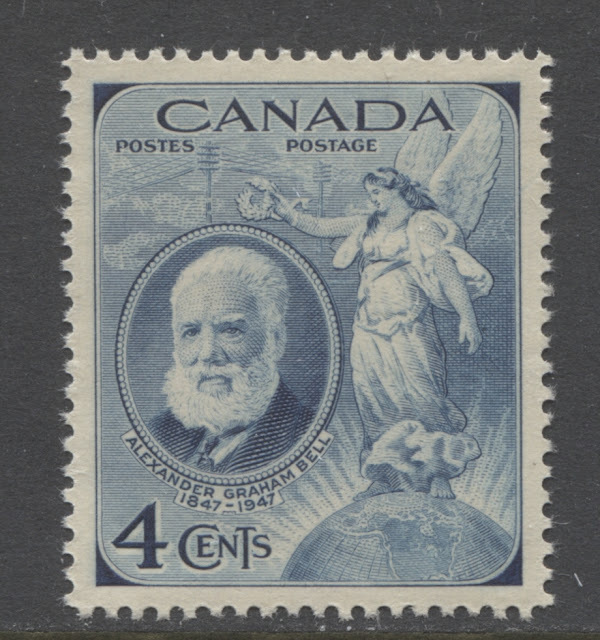 I have only seen this on the 1947 Alexander Graham Bell stamp. The third type is similar to the second, except that light vertical ribbing can be seen on the gum. Again, I have only seen this type with the 1947 Alexander Graham Bell stamp. The fourth type is a ribbed vertical wove where the ribbing can be visible on the face, the back, or both sides of the stamp. With this paper I have seen two types of gum. One is a yellowish cream with a satin sheen and the other is a lighter cream that is very shiny, with a glossy sheen. The first type seems to be found on the issues from mid 1947 to 1951. By 1951, the fourth type seems to predominate. However, it would be interesting to study the papers and see if any of these issues can be found on two or more paper types. Here we have three examples of the 15c Capex, showing two distinct gum types. The middle stamp is the earlier yellowish cream gum with the satin or semi-gloss sheen. 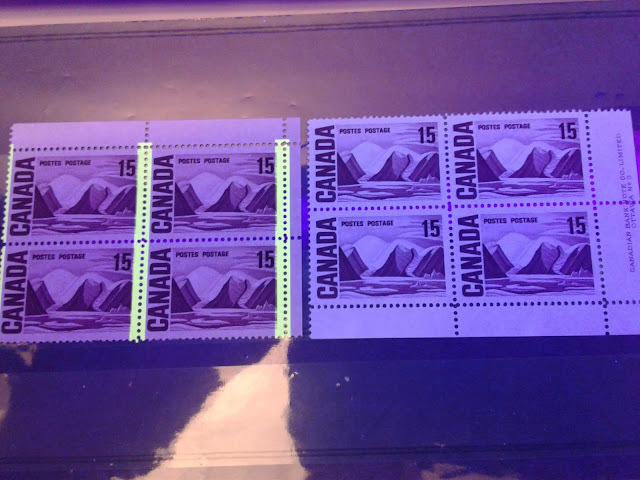 The stamps on either side have a gum that is much less yellow and more towards white, while at the same time, being much shinier, with a glossy sheen. 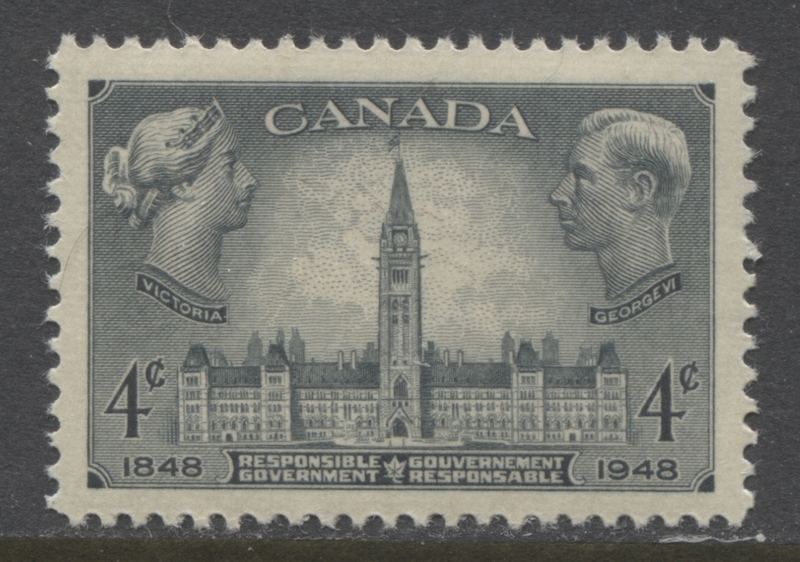 Here are two examples of the 1951 Royal Visit Issue. It doesn't show up very well on the scan, but the stamp on the right shows very clear horizontal ribbing on the gum, in addition to the yellowish cream colour and satin sheen. The stamp on the left does not show the ribbing, and has a lighter cream coloured gum. So the above two variations suggest that it is quite probable that every one of the 13 stamps can be found with at least two combinations of paper and gum. 4c citizenship - 2 plates, 8 blocks. 4c Princess Elizabeth - 2 plates, 8 blocks. 4c responsible government - 2 plates, 8 blocks. 4c Newfoundland - 2 plates, 8 blocks. 4c Halifax - 2 plates, 8 blocks. 3c Borden - 2 plates, 8 blocks. 4c Mackenzie King - 2 plates, 8 blocks. 4c black Capex - 2 plates, 8 blocks. 5c lilac Capex - 2 plates, 8 blocks. 7c dark blue Capex - 2 plates, 8 blocks. 15c vermilion, Capex - 1 plate, 4 blocks. The last of these, the Royal Visit issue is known with the upper left position of plate 1 having a cracked plate. Some of the others may exist this way as well, and are just waiting to be discovered as well. 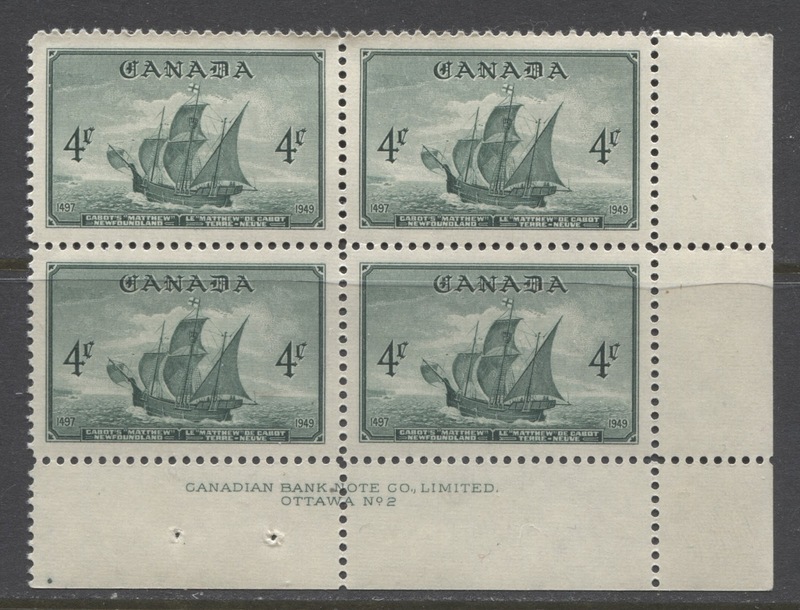 This lower right position of plate 2 from the 1949 Newfoundland issue shows a single green dot in the bottom selvage, to the left of the inscription. This is what we would normally expect to find on a typical lower right block from issues printed by the CBN in this time period. This lower right position of plate 1 of the 7c Capex issue shows two dots. One is in the same position as the above block, but the other one is found in the right selvage tab just opposite the upper right stamp. So it would appear that there could be two different lower right block types for at least some of these issues. Here is a lower left block of the 15c Capex showing two dots as well. One is clearly visible underneath the inscription in the bottom right selvage, while the other one is located very close to the upper edge of the left selvage tab just opposite the order number. 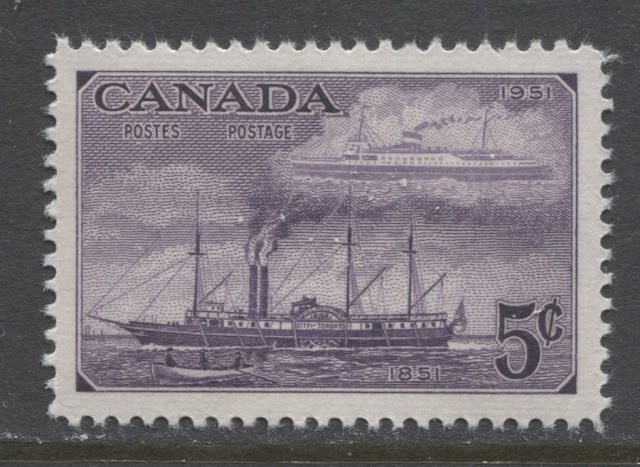 This again is different from a block that I saw of the 4c Mackenzie king that had no dots at all. So it is difficult to say whether these two varieties exist on every lower right and lower left block of every stamp in these issues, but it is certainly a question that is worthy of additional research. However, it is easy to see how a basic collection of 104 plate blocks can grow into a collection of a few hundred plate blocks once these different position dot configurations, shade varieties and paper and gum varieties are taken into account. I'd appreciate input as to what other numbers you have seen on the lower left blocks of this issue. The only re-entry that has been reported by Trimble on these issues occurs on the 4c citizenship stamp. On this stamp there is doubling of some of the shading lines in the lower right corner as well as the hidden date. You can view an example by clicking on the following link. With the large number of printed stamps relative to the number of plates used for these issues, I am fairly confident that there are more re-entries out there that are just waiting to be found. Most will likely be quite subtle, like this one is. However, subtle or not, they are fun to seek out and collect. 1 Large hardened die proof on India paper in the issued colour. 1 Large unhardened die proof on India paper in the issued colour. 4 Large trial colour proof on india paper. 1 small trial colour proof on India paper. I am not sure why the site does not list proof material for the other issues included here. It might be that no pieces are known in private hands. But, as the above essay shown above for the 4c Capex unadopted design shows, such material does indeed exist. These two covers both have the official Toronto wavy line FDC cancel. However, you can also find many of these types of covers used in the smaller towns. So there are several ways you can collect these FDC's"
You can attempt to find as many different cachets as possible. You can also add, for each cachet, a different town or city that the cover came from. 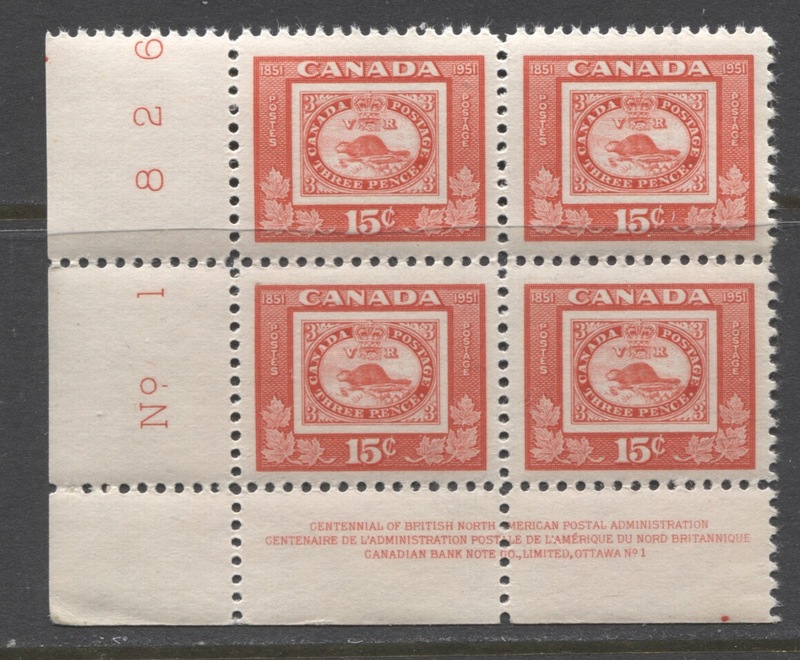 You can look for covers that have plate blocks or pairs, rather than just single stamps. You can look for cachet errors. These can include misprints of the cachet or the wrong cachet used on the cover. Even with just 13 stamps, you could easily collect a few hundred different covers, if you wanted to take it to the extreme. 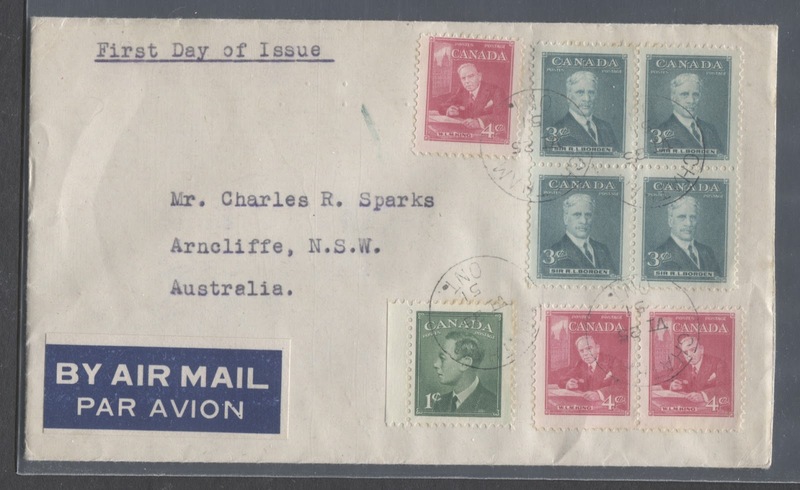 Here we have a 25c airmail FDC to Australia. There is no cachet, which makes it a bit less desirable, but the destination and the franking more than make up for that. Normally, the 25c rate would be paid with a 20c definitive and 5c definitive, or maybe a pair of 10c stamps and a 5c. But this cover has the rate being paid with a block of four of the 3c Borden, three of the 4c Mackenzie king and the 1c Postes-Postage definitive, which was current at the time. There were no other commemoratives that were still in-period when this issue came out, so this cover is as good as the usage can get. 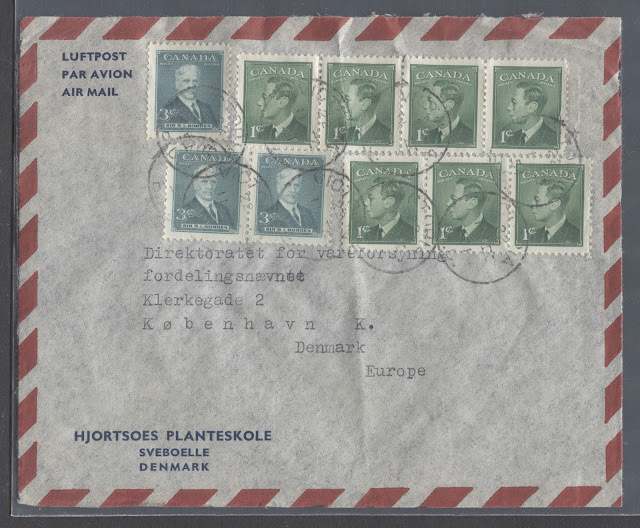 Here we have a September 1951 airmail cover to Denmark, which as far as Western European countries go, is one of the better ones. 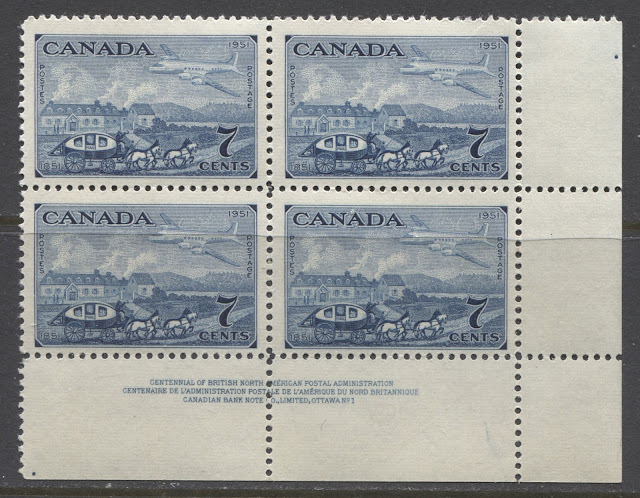 This is an interesting cover because it is overpaid by a cent, when the rate was 15 cents, and it didn't have to be, since six of the stamps used to make up the rate were 1c Postes-Postage definitives. 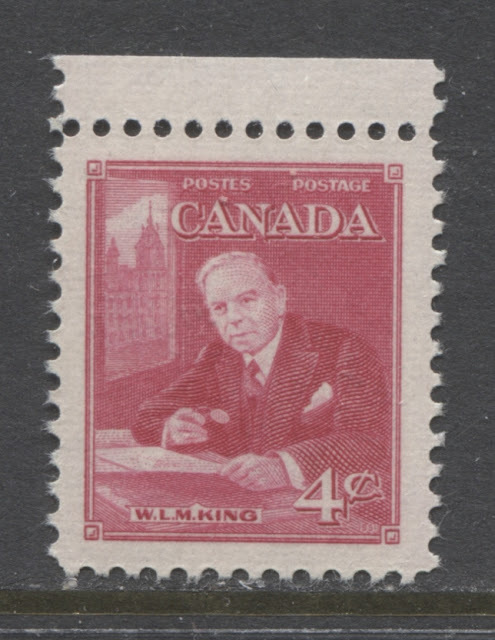 This is a good cover, but it could be much more desirable if instead of six 1c definitives, there was a larger variety of stamps, including the 4c Mackenzie King. 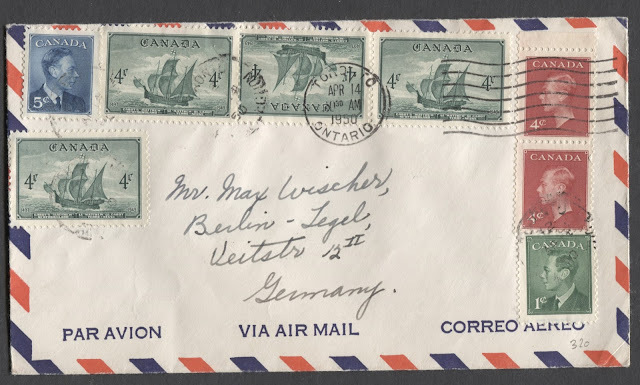 Here is an April 1950 double weight airmail cover to Germany that has the 30c rate being paid by four of the 1949 Newfoundland commemorative and a nice range of the Unrevised Postes-Postage designs, which were issued in January 1950. The usage of the commemorative is a trifle late, but still not so late as to make it undesirable to a postal historian. The only way this cover could really be improved is if at least one of the Newfoundland commemoratives were switched with a Halifax Bicentenery stamp instead. This last cover is a bit plain, but it is a good example of how the 15c Capex Issue was used as a definitive. This is a double weight airmail cover to Denmark, mailed in March 1953 - a year and a half after the Capex issue was released. So it is well past the time when this issue would be considered out of period. 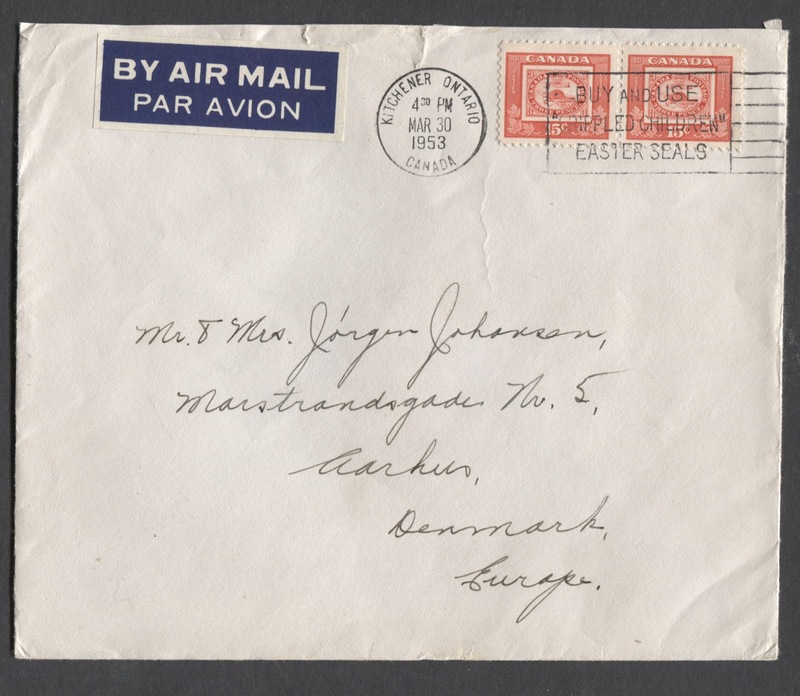 However, it is clearly not a philatelic cover, because there is nothing particularly attractive about it. Yet, the 30c rate has been paid with a pair of the 15c stamp. This all makes sense when we consider that the 15c Gannet stamp would not be available for another year. So these are some examples of how you can make the collection of postal history from this period interesting. In addition to focusing on rates and destinations, you can also look at important world events that were taking place during this time, such as the beginning of the Korean War, for example, and can seek out mail items going to Korea. In addition to covers, you can collect a practically endless assortment of CDS and split ring town cancels, not to mention boxed purple or violet MOON and POCON cancels. These are extremely inexpensive stamps that can still be found in large bundles for as little as a penny a piece, or less. So you can have a great deal of fun on a very limited budget. The only stamp that is a little pricier than this is the Capex issue, especially the 5c. However, even this issue is still relatively inexpensive on a wholesale basis. This brings me to the end of the King George VI period. 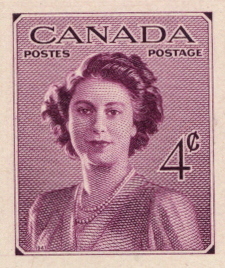 I have already written extensively about the first two Queen Elizabeth definitive issues, so I will spend some time over the next several weeks writing about the commemorative issues that were released between 1952, when the Queen ascended to the throne, and 1962 when the next definitive set, the Cameo Issue was released. Next week's post will look at the commemorative issues that appeared in 1952, 1953 and 1954.